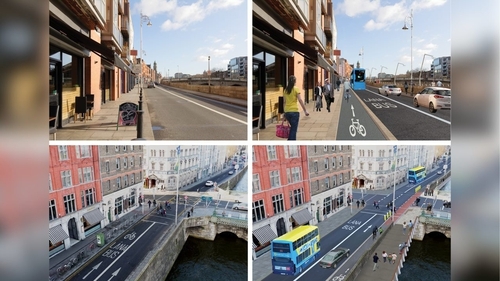 A new proposed route for the €20m Liffey Cycle Route will involve tracks on both sides of the river according to a plan announced by the National Transport Authority. The design, intended to end seven years of planning controversy, is to go out to public consultation. The route would involve cycle tracks on both the north and south quays on the building side of the road for 2km from the Phoenix Park to the Four Courts. The tracks would avoid busy bus stops by switching to the riverside from there to Matt Talbot Bridge, and in the Docklands there would be two-way cycle facilities on either side of the river to the Eastlink Bridge. Boardwalks would be built for pedestrians where needed, such as Aston Quay. The scheme would involve the loss of 33 trees, including most of those on Bachelor's Walk, and around 60 car parking spaces. The NTA came up with the plan after taking over the project. It had failed to be agreed despite eight different options put forward by Dublin City Council. All involved a two-way cycle track along the north city quays. It ran into problems caused by pinch points along Ellis and Arran quays that would have required rerouting of cars or buses or cyclists. The idea of having separate routes on the north and south quays was considered to have logistical problems and was rejected as one of the four proposals put out to public consultation in 2015. The new plan for two separate tracks was agreed by the council's transport committee this afternoon and will now go for public consultation. Committee chairman, Green Party Councillor Ciarán Cuffe, said a cycle route from the Phoenix Park to Dublin Bay is an "amazing vision". Dublin Chamber and the Automobile Association (AA) welcomed the plan as there is no longer a proposal to reroute traffic. Colm Walsh of the Dublin Cycling Campaign said the segregated track will help bus priority and pedestrian access as well as making the quays safer for pedestrians. The NTA says a new business case will have to be approved by Government. It is hoped that construction will start next year.